Create animated Business and IT Technology Roadmaps yourself starting with a Trial Account here. Take a peek at the Dragon1 Step-by-Step Guide. 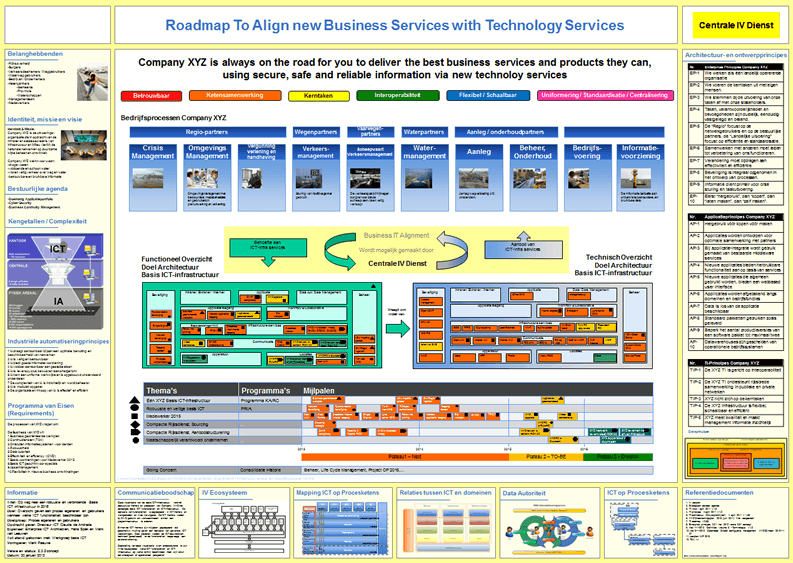 This is a Business IT Services Technology Roadmap sample created on Dragon1. Dragon1 is a collaboration platform, on which you as Business Professional can learn, create, share and control interactive content. A Business or IT Technology Roadmap is a standard architecture product best created in the form of a static or dynamic A0-sized architecture poster used by CxOs and IT Management. With the roadmap they will have an overview for themselves and for the business of when and what new technology will be introduced in the organization. A business or it roadmap template for new technology or web services makes it easy to communicate timelines and manage expectations. It will prevent the business from buying ad-hoc solutions and tools and introducing unwanted and costly solutions, tools and technology. Click the image to enlarge the Business IT Services examples. How is this Technology Roadmap template build up? This technology roadmap template relates different types of information together, compliant to the Dragon1 EA & Performance Framework: 1) Strategy (Left and Bottom sections), 2) Architecture (Middle section and Right sections) and 3) Business Changes (Middle Bottom section). With this roadmap template of business it services you as IT manager can gain more control over the agenda of innovation and renewal of IT in your organization. We hope we have inspired you to start creating Business IT technology roadmaps. Do you want to start immediately? You can purchase your Dragon1 PRO user license here online via Paypal. If you do not have the time and you need a Technology Roadmap on short notice, we can create a Roadmap for you.